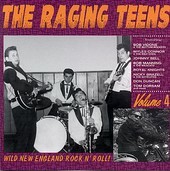 With Bob Vidone & The Rhythm Rockers, Johnny Bell, Royal Knights, and Tom Dorsam, as well as others, The Raging Teens Volume 4 showcases the cream of the crop New England rock 'n' roll bands from the late fifties and early sixties. Enjoyable rhythms, danceable in every way, with a lot of vocal ump, the wild and crazy, youthful sounds come across as dated. Yes, but in this day and age where vintage rules, the bands and songs on here don't sound out of place, fitting in better than most of their imitators. Here is a solid, sturdy collection of delightfully engaging and playful tunes embracing the ultimate spirit of rock 'n' roll: to have fun. I'll give it an A. Various Artists: The Necessary Effect: Screamers Songs Interpreted Various Artists: The Rhythm Teens: Rare & Unissued New England Vocal Groups!